The past week of my life has been incredible. Exactly one week ago, I landed in sunny Johannesburg, South Africa, for a six-week student exchange and the amount of exploring and learning that I have already experienced is astronomical. As an only child, I have never experienced what it’s like to have siblings or live in a big family. So, coming to a house which, at times, can have six teenagers is interesting. While living here, I can certainly say that I haven’t been bored once. Almost every day, you experience “load shedding” while living in South Africa. Load shedding is when all of the power gets cut off and it can be off for two to six hours a day. Many people lack generators and as I woke up on my first morning, my exchange handed me a lamp and I got ready for my first day at St Stithians Girls College in the dark. This was certainly a change and it was cool to experience something so different within the first twelve hours of my exchange. Another difference is that people walk between the lanes at the traffic lights, selling items, such as hats, sunglasses and phone chargers. Again, this was completely different and quite eye-opening. It is also common to see ten people sitting in the back of a truck in the open while driving around. Many people here get to places by taxi. Even though they do have taxis and Ubers as we do in Montreal, the taxis that most people take are minibuses that can fill up to around 12 people! One thing that I still can’t get over is the campus at St Stithians which is an incredible 105 hectares. 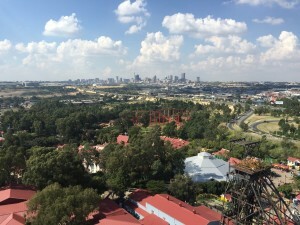 It has a pool, multiple fields, netball and basketball courts, a small dam and even a restaurant located at the top of the campus where you can see the city of Johannesburg! I actually have managed to get lost during a run but eventually found my way back. It’s definitely taking some adjusting but I’m sure that, by the time I leave, I will be able to get around the school without getting lost. Last weekend was a long weekend for Human Rights Day, so my exchange family took me to a lot of different places. We went to Maropeng, an area nicknamed “the cradle of humankind” because bones from some of the earliest living humans have been found there. 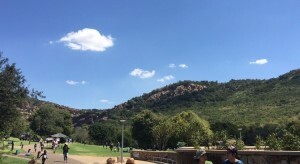 We later drove to the Walter Sisulu National Botanical Garden to have a picnic and walk around. It was absolutely stunning and I saw an incredible waterfall. On Friday, my exchange and I went to Gold Reef City amusement park with some of her rowing friends. I was also able to go down into a mine while there! It was again, very eye-opening, as we were only on the second floor, which was 75 metres deep and there were a total of 49 floors! Then on Saturday, I went to an Ed Sheeran concert, which was one of the best concerts I have ever been to and I was able to bond even more with my exchange family. On Sunday, my exchange family had 23 members of their relatives come over to their house for lunch/dinner. This was very different for me, as all of my relatives live in different continents and I barely ever see them. To see 23 people from the same family all in one place was something I had never experienced before. This entry was posted in general and tagged grade 9, independent school, lcc, lower canada college, South Africa, student exchange by admin. Bookmark the permalink.